This is the best for peeling veggies and cutting long, even carrot curls. These make it super easy to keep the rolled carrot strips intact, and these won't rust like metal paper clips. 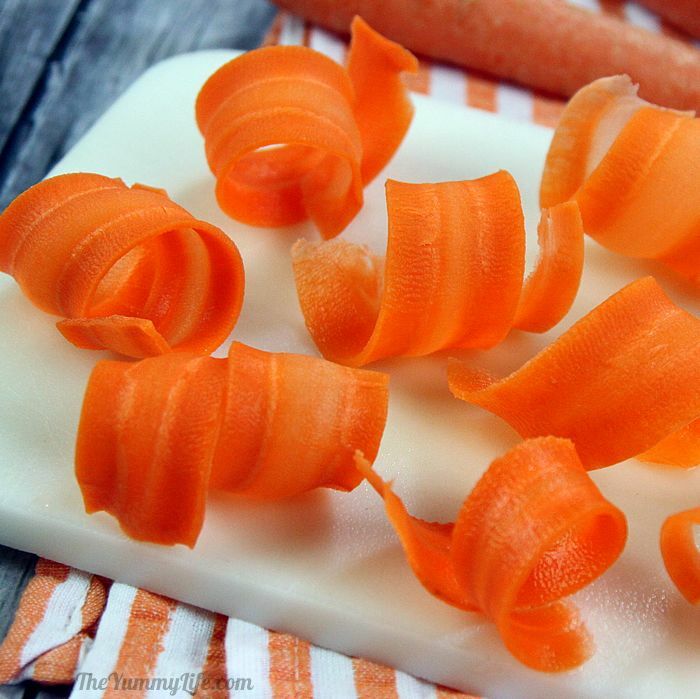 Easy Carrot Curls make colorful, edible garnishes on salads and antipasto platters. They're also a fun alternative to carrot sticks to serve with sandwiches or a fresh nutritious side with any meal. Kids love them! 1. Peel the carrot and discard the peelings. 2. Lay the carrot flat on a cutting board. Starting at the wide end of the carrot, use the peeler to cut thin, even strips that run the entire length of the carrot. Depending on the size of your carrot, you should be able to cut 8 to 10 strips per carrot. There will be a leftover piece when you're through that you can eat or chop and freeze to use later in soups or other recipes. 3. Roll each carrot strip, starting at the narrow end and rolling it towards the wider end. Secure each one with 1 or 2 vinyl paper clips. 4. Place rolled carrots in a container that has a lid, and cover them with cold water. Add a few ice cubes to lower the water temperature, cover, and refrigerate for at least 2 hours and as long as 2 days. 5. Drain the water, remove the paper clips, and gently twist the 2 ends of the curls in opposite directions to give them a spiral appearance. 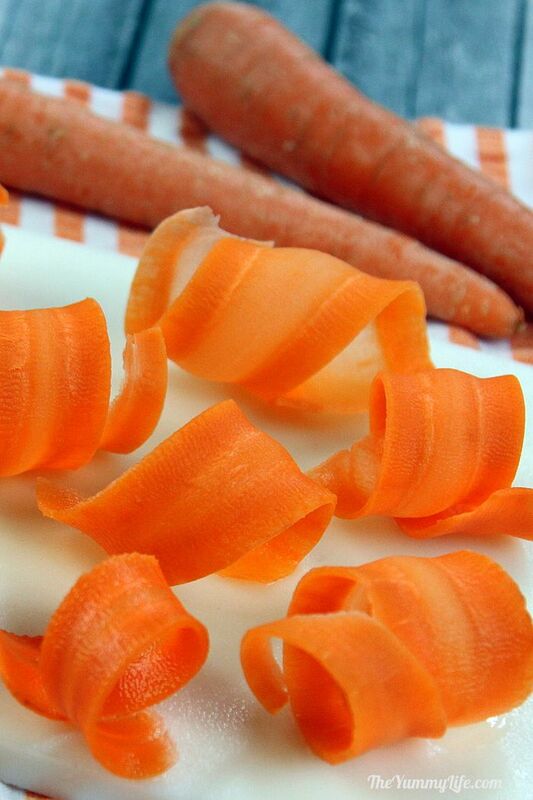 TO SERVE: Use the carrot curls for colorful, edible garnishes on salads and antipasto platters. They're also a fun alternative to carrot sticks to serve with sandwiches or a fresh nutritious side with any meal. TO STORE: Keep the drained carrot curls in the fridge in a sealed plastic bag or lidded container. They'll be good for up to a week. I learned to make carrot curls years ago when I worked in the kitchen of an Italian restaurant. They were a colorful, edible garnish for the restaurant salads and antipasto. 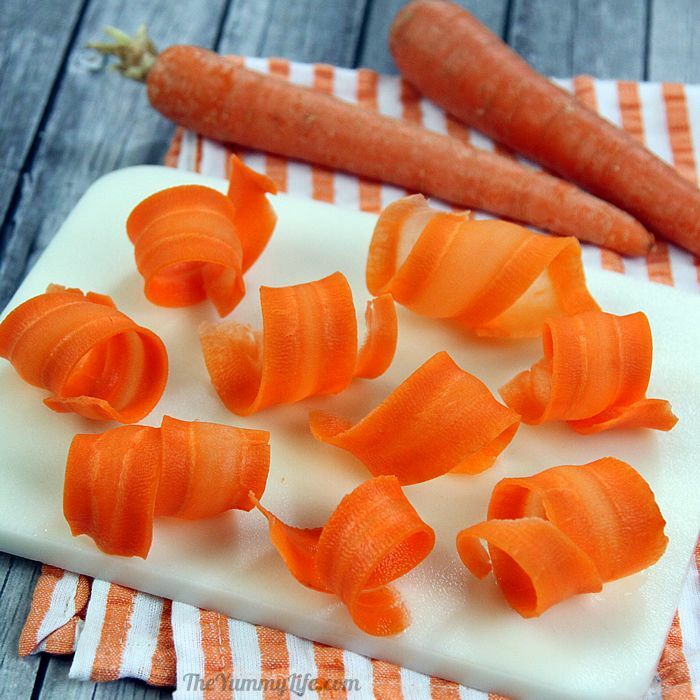 Carrot curls are so easy to make, and they add flair, crunch, and a fun factor that may even encourage kids to eat their carrots! It only takes a few minutes to prep them, and they will hold in the fridge for at least week. That way they're handy to add to salads or simply pretty up your sandwich or dinner plate with something fun and nutritious. carrots -- I like them to be at least 1" wide at the top--even wider is better. You can use smaller carrots, but the big ones make the best curls. Step 2. Peel the carrot and discard the peelings. Step 3. Lay the carrot flat on a cutting board. Starting at the wide end of the carrot, use the peeler to cut thin, even strips that run the entire length of the carrot. Depending on the size of your carrot, you should be able to cut 8 to 10 strips per carrot. There will be a leftover piece when you're through that you can eat or chop and freeze to use later in soups or other recipes. I freeze my leftover carrot bits for making Slow Cooker Chicken Broth. Step 4. Roll each carrot strip, starting at the narrow end and rolling it towards the wider end. Secure each one with 1 or 2 vinyl paper clips. Alternatively, you can use a toothpick to spear through both sides of the curl and hold it in place; but once I experimented with paper clips I found them to be much easier to use than toothpicks. Step 5. Place rolled carrots in a container that has a lid, and cover them with cold water. Add a few ice cubes to lower the water temperature, cover, and refrigerate for at least 2 hours and as long as 2 days. 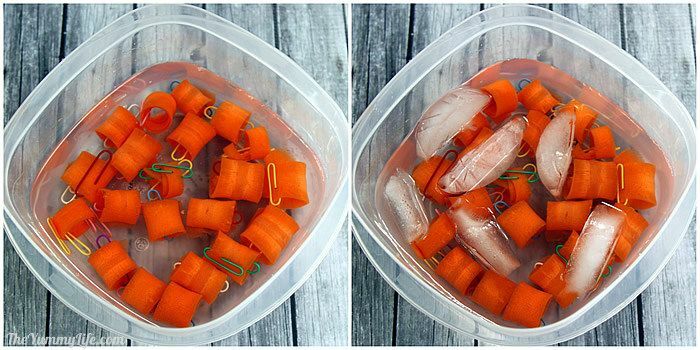 Not only does the ice water make the carrots hold their curled shape, but it also makes them super crunchy--the taste and texture is so good! So, they don't just look pretty and fun, they are great eatin', too. Step 6. Drain the water, remove the paper clips, and gently twist the 2 ends of the curls in opposite directions to give them a spiral appearance. They will remain permanently curled out of the water. Now for the fun part. Use the carrot curls for colorful, edible garnishes on salads. 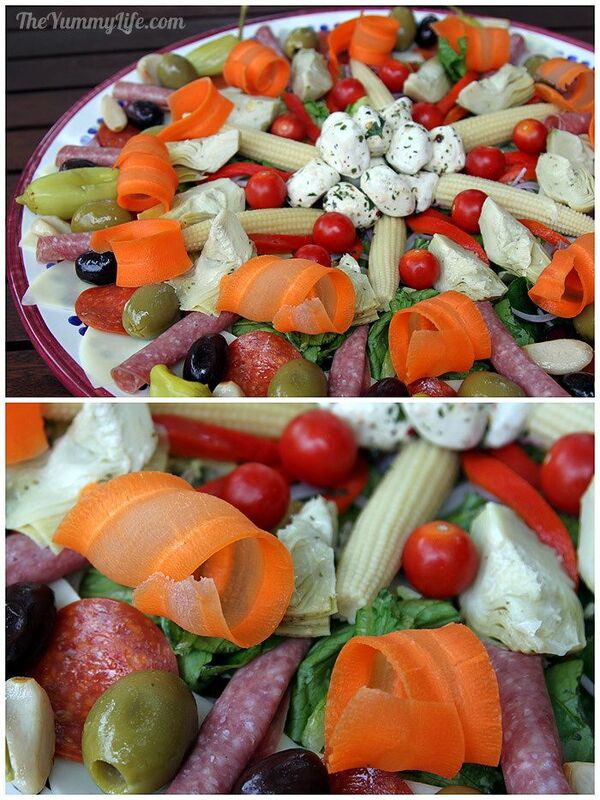 Look at the color and texture they add to my antipasto platter pictured below. They're also a fun alternative to carrot sticks for snacking and to serve with sandwiches or a fresh nutritious side with any meal. Kids love to curl them around their fingers like rings...and then eat them! Store the drained carrot curls in the fridge in a sealed plastic bag or lidded container. They'll be good for up to a week, and they maintain that extra crispy texture. Yum!